Grandpa Green tells the story of a man from birth to old age. It is told from the point of view of a young boy as he walks through his great-grandfather’s garden. More of the story is told through illustration than words, so it’s crucial to pay attention to every page, because there’s another layer to the story hidden there! Lane Smith’s illustrations are absolutely breathtaking. Though the book has words, flipping through the pages feels as memorable as flipping through a photo album. Each page is packed with meaningful illustrations that go well beyond the scope of the words themselves. The illustrations look simple, because they consist of line drawings with very few colors, and the green areas are more heavily sponged. All of the colors are very muted; even the greens are strong rather than vibrant. This type of illustration works perfectly with the subject matter. The words are very matter-of-fact, telling the story with no adjectives or adverbs. Even the text is a dark green, as if Smith didn’t want the font to take away from the illustrations. This is a great choice because the illustrations tell so much more. They should be studied as long as possible before turning the page. I wasn’t sure what to expect when I got this book. The cover looked almost monochromatic, so it didn’t really grab my attention. Also, I hate to say it, but sometimes I overlook award winners because I figure they must be stuffy if a panel liked them. (That opinion, I must say, has gone out the window after reading for this class!) I knew Lane Smith from his work with Jon Scieszka, but those projects were much sillier. In comparison, this book looked boring. Once I opened the book, I appreciated the contrast of the heavily painted topiaries next to the delicate line drawings. On my first reading, I read the text quickly, scanned the pictures, and finished thinking, “Huh, that’s it?” I read it several more times for class, loving it more each time. I spent several minutes on each page, and I think it’s crucial to do so because there are some little jokes hidden there, and it’s easier to understand the story. On the page about the world war, for example, it is incredibly important to take in the illustration piece by piece. As a whole, it looks beautiful, but once you look at every element, you appreciate it so much more. So then you go back to the first page to see it all again. It’s a good thing the illustrations are gorgeous, because this book seems very sad to me overall. The boy learning about his great-grandfather’s life reminded me of my own grandfather, who also fought in a world war and became very forgetful in old age due to Alzheimer’s. The fold-out pages near the end are bittersweet, with the final image giving closure to the story. 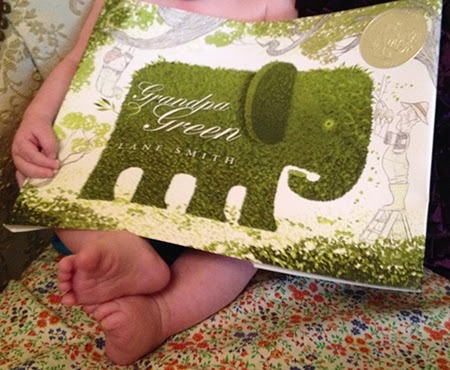 Grandpa Green is a Caldecott Honor book, and once you see the illustrations, you’ll understand why! It was also one of Publishers Weekly’s Best Children’s Picture Books for 2011, and one of School Library Journal’s Best Picture Books of 2011. - This book reminded me of The Giving Tree by Shel Silverstein. I think it would be fun to have a program where both books are read, and listeners can compare and contrast them. - Reading this book (or perhaps rereading it) can be made into a scavenger hunt. Children are given a list of items to find in the book and write down the page number where they find the picture. Items can range from some of Grandpa Green’s lost belongings to more general things cut into the topiaries. - This book might inspire children to learn more about their grandparents’ or great-grandparents’ lives. They could conduct interviews to start a family history, and further that research at the library. Or, if they have no living grandparents, they can pick an aspect of the book to research, such as a world war.